There's even a sports card music mystery! If there is a sports card photo that seems mysterious to students, it often features a player from the St. Louis Blues hockey club! Few students are able to explain what the music note logo represents on players’ sweaters. There is rarely any association for youngsters between the symbol or name of the club and the song of its name or even the type of music Blues encompasses. Acquire a copy of the song and play it in class. Even if it's an instrumental version, the kids will get a great idea of Blues, a distinctly American music genre. Does that just jump us over into language study to describe the English idioms got the blues? and feeling blue? Trading cards are like that – now one subject, now another. Find a sports card player born in a different country from yours. * What is that country’s national anthem called? Play it for your classmates. * Why are the national anthems played at major sports events? Why is this important? What does it promote? Divide all the trading cards you can find for a single team into two piles: one showing the "home" uniform, the other showing the "road" version. * What music/songs are played in the home stadium? * What music/songs would you plan for the team on a road bus trip? Attend or watch a televised stadium or arena game that features music. Try to identify the names of the snatches of tunes that are played. * When are they played? Why? * What cheers and chants can you hear? * What clapping rhythms can you hear? * Try some of these out in your classroom. 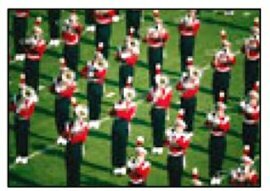 Create a trading card set that features each member of the school band. * What colors will you choose for borders? * What kind of information will you place on the verso of each card? Return from Teaching Music from Sports Cards to Sports Cards hub page for even more sports card teaching ideas! Return from Teaching Music from Sports Cards to Real World Content Advantage home page.